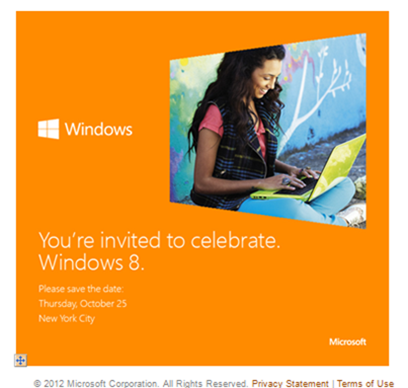 While the iPhone 5 remains one of the hottest news topic for almost the entirety of the technology blogosphere, Microsoft has silently sent out invites for the launch event of their upcoming desktop operating system Windows 8. As expected, the date is in the last few days of the month of October. Check out all the details after the jump. The news comes from Mary Jo Foley – a renowned blogger focused on covering Microsoft – in the form of a short post in which she discusses the invite image she received from Microsoft. The image in question, which we’ve posted below, invites the reader to celebrate Windows 8 by coming to New York City on Thursday, October 25th. There is no specific time or venue mentioned, which leaves us a little puzzled. Obviously, Microsoft can’t hold a grand, city-wide Windows 8 festival, so expect them to announce specific venues and times as we head closer to the date. New York City has been the chosen city for launch events for previous Windows versions like XP, Vista and the well-received 7. Windows 8 is a very important release for Microsoft as it makes some very significant changes to the user-experience. The UI has shifted from a mouse-oriented one to a more streamlined, touchscreen-oriented one; something that can be seen in the way the Start Screen has changed and the way the Desktop as we all know is treated as an app. Most people who have used the preview version of Windows 8 have received the change negatively, but many others have found the change to be a positive one. But the UI isn’t the only thing that has received an update. Microsoft has added a Windows Store for downloading and managing apps, Easy Backup / Restore / Refresh, cloud integration with SkyDrive, Xbox LIVE, Internet Explorer 10 and plenty of smaller, but still important changes and new features. Of course, MSDN and TechNet subscribers have had access to the final version of Windows 8 (RTM) for more than a month now. If you are a subscriber, you can download Windows 8 RTM for free. Other folks will have to wait till October 25th for retail availability. XP, Vista and 7 users can upgrade direct to Windows 8 Pro with a $39.99 download; those who prefer physical copies will be able to get it for $69.99.